Sightsee med en lokal guide i Turin och upptäcka stadens charm på en 2-timmars promenadstur. Med en liten grupp på bara 15 personer utforskar du den romerska fyrsidan och Piazza Castello till fots, och kolla ut landmärken som matstallarna i Porta Palazzo, de historiska rika arkaderna Via Po och Mole Antonelliana-byggnaden. Gå till Piazza CLN i Turin klockan 10.30 för att träffa din guide och börja din rundtur i staden. Till fots går du genom livliga och livliga torg som Piazza San Carlo där bohemiska typer och kändisar gillar att träffas. När du utforskar, lyssnar du på historier om staden för att lära dig om dess historia, kultur och quirks. Venture in i den gamla romerska fyrsidan, en gammal enklava där de ursprungliga stadsmurarna och porten kan ses. Fortsätt härifrån till matmarknaden i Porta Palazzo och vandra bland boder laddade med regionala produkter som din guide talar om lokal mat och ge tips för restauranger att besöka. 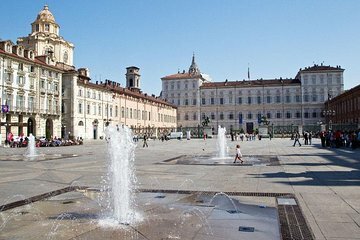 Promenera genom Piazza Castello, hem till Turin-katedralen och Palazzo Reale, och beundra de historiska arkaderna Via Po, fodrad med bokhandlar, kaféer och butiker som säljer hantverkare. Slå en pose för ett foto framför Mole Antonelliana som din guide förklarar sin historia, sedan huvudet till Piazza Vittorio där din vandring slutar. I ended up having a private tour with Stefano this week. He was knowledgeable, friendly, and personable. I highly recommend his walking tour of Torino! Because of the holiday weekend, my husband and I had a personal tour of Turino! Stefan was a great guide and a wealth of knowledge. He took us to a wonderful local market and gave us a great tour. His recommendation of location for a place to eat was the best! We had so much fun visiting Turin and taking this tour. Thank you Stefan for making this day special! Guide was great! Very knowledgeable, fluent English, passionate about Turin and Italy, personal with tourists. We went inside of many churches, visited central city, old Roman city, and open market. Great intro to the history and architecture of Turin. Sorry for dragging Stefano out through the rain, but the tour was great!! He personalized everything about the tour for us and was extremely knowledgeable about the city and it’s history. Hope to return someday for the Chocolate Tour. Sounds like it will be amazing!! It was a great way to see the city in one day. Our guide was articulate, knowledgeable and relaxing to be with. It was the right amount of time for walking. Stefano is informative and very easy to work with! We really enjoyed our tour with Stefano. He emailed and texted us ahead of time to make sure we knew where to meet. It turned out that we were his only clients that day so we basically had a private tour. He is very knowledgeable and happy to share that knowledge with us. We also had a nice chat over coffee at a local bar. I liked Turin a lot. It was not crowded with tourists and there are many interesting things to see there. I would definitely recommend booking this tour. The walking tour was a good intro to Turin, which is a flat city, set out on a grid and made for walking. As well as showing me the main sites, my guide Stefano also told me about the Torinese drink Bicerin and where to drink it, explained the city's superstition involving a bull's private parts the bull is the symbol of the Turin, and lots more not covered in a guidebook. Definitely recommend this tour. Very informative and professional morning with Stephano. A nicely paced walk to enjoy the highlights and learn some of Turin's history. Stephano did a great job - a morning swell spent. Loved it!! Stefano was a fabulous guide very knowledgeable and flexible in showing us what we were interested in.